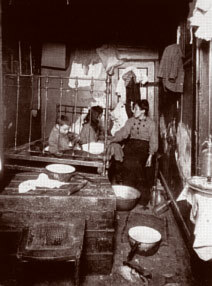 The Italian masses that flowed into the North End on the heels of the departing Irish and at the apex of the Jewish settlement found a neighborhood in dire physical condition; a rundown, overcrowded slum of deteriorating tenement buildings. The first Italian immigrants came in the 1860s from Genoa and settled in a three-block area off Fulton Street, adjacent to the Jewish Menorah Products poultry slaughterhouse. They numbered fewer than 200, but during the 1880s, the immigrant tide began to shift — of the 15,000 Irish that lived here in 1880, barely 5,000 remained by 1890. The Genoese were followed by the Campanians, who were followed by the Sicilians, the Avellinese, the Neopolitans, and the Abruzzesians. Each group settled in their own area within the North End, creating their own enclave within the greater North End neighborhood. The North End had also changed in a number of other significant ways over the preceding decades. Formerly Protestant churches were acquired by the Catholic Archdiocese of Boston – reflecting the ascendancy of Irish Catholicism throughout the neighborhood. The Seamen’s Bethel became the Sacred Heart Church in 1871 after Rev. Edward Taylor’s death. The Bulfinch-designed New North Congregational Society became St. Stephen’s Church. In 1873 a new Italian-Portuguese Catholic church, St. John the Baptist, was dedicated, and in the same year St. Leonard’s Church was founded. St. Leonard’s, at the corner of Hanover and Prince Streets, was completed in 1899, becoming the first Italian church in New England and the second oldest in America. During this same period, a new Settlement House Movement swept through Boston’s North End. It took several forms. Some settlement houses were established to assist immigrants in adjusting to their new life in America. For example, the North End Union provided food and aid to several generations of immigrants. In the 1880s, it housed the Children’s Mission which developed “The Boston Sand Garden Project”, the city’s first public playground. A North Bennet Street Industrial School was also founded in 1881 by Pauline Agassiz Shaw to teach Italian and Jewish immigrants skills needed to obtain employment. And eight years later, Lina Hecht set up her Hebrew Industrial School next door to teach needlework skills to Jewish women. Then there was the “Saturday Evening Girls” library club. It was founded in 1899 by Edith Guerrier, a 21-year-old librarian who maintained a reading room at the North Bennet Street School. She came up with a novel approach to keeping Jewish and Italian young women “off the streets” while at the same time advancing their education and well-being. Her library club held meetings on Saturday evenings at which literary scholars, writers, historians and social reformers would present talks. With the encouragement and financial support of Boston philanthropist Helen Osborne Storrow, Guerrier and her friend Edith Brown, an artist, also formed the Paul Revere Pottery on Hull Street in 1908. The aim was to help their “Saturday Evening Girls” to become financially self-sufficient. The young women worked eight-hour days in “an airy, healthful atmosphere” and received a decent wage, an annual paid two-week vacation, and a daily hot lunch – all of which were virtually unheard of in the early 20th-century workplace. Paul Revere Pottery is today a valued collectible. 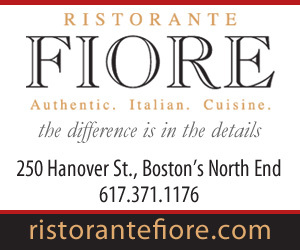 By 1900, the Italian population in the North End was 14,000. Over the next 20 years it would more than double to 37,000 and at its peak, in 1930, 44,000 Italians were packed into an area less than one square mile in size. 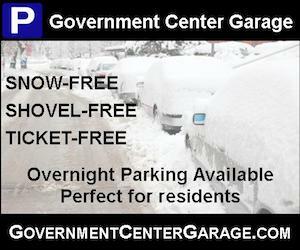 As North End historian William DeMarco notes, “By comparison, the parking lot at Florida’s Disneyworld is three times larger than the inhabited area of the North End.” The neighborhood had become 99.9% Italian and was said to be more densely populated than Calcutta. The first arrivals, the Genoese, made their living as fruit and vegetable vendors and as peddlers selling wine, cheese, and olive oil from North End storefronts and from stalls along the open air Haymarket in Dock Square. Access to these North End markets and shops was greatly facilitated by the construction of North Station (in 1893) and by the Metropolitan and West End Street Railway companies. In the meantime, the Sicilian immigrants, who had colonized the length of North Street along the harbor by 1925, found employment in the booming commercial fishing fleets.Others were able to find work in the construction trades – as masons, metalworkers, carpenters, and general laborers – with Italian owned and operated contractors. But to no small degree, it was the neighborhood itself that offered many job opportunities – providing for the feeding, clothing, servicing and ministering to the masses of fellow immigrants and paesani that filled the neighborhood to overflowing. In 1920, the North End had 28 Italian physicians, six Italian dentists, eight funeral homes, and along just one block of Hanover street four or five barbershops. Most North End businesses were of the “Ma and Pa” variety – small grocery stores, butcher shops, and bakeries, dressmakers, cobblers and shoe stores. 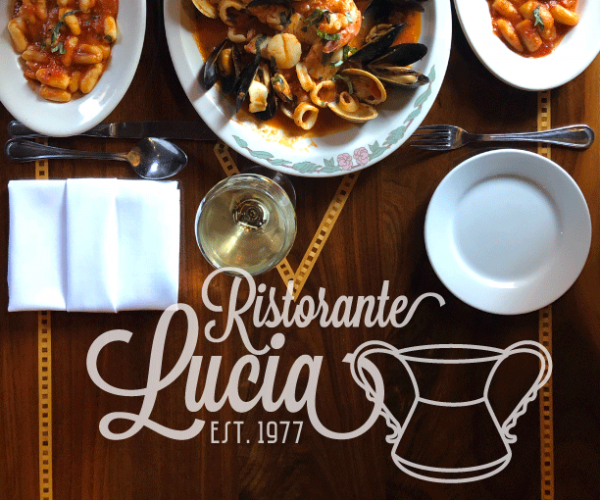 Each had their favored clientele.Two noted exceptions to this “Ma and Pa” variety were founded by Luigi Pastene and by three Sicilian friends, Gaetano LaMarca, Guiseppe Seminara and Michele Cantella. Luigi Pastene came to Boston from Italy in 1848 and began selling produce from a pushcart. By the 1870s, he was joined by his son, Pietro, in establishing Pastene as a company specializing in selling groceries and imported Italian products. By 1901, Pastene expanded its operations to facilities along Fulton Street in the heart of the North End Genoese district. Today, the Pastene Corporation is a major national brand with distribution and packing facilities established in New York, Montreal, New Haven and Havana, as well as in Italy in Naples and Imperia. The three Sicilian friends- LaMarca, Seminara and Cantella – started a small macaroni and spaghetti manufacturing business in 1912 at 90-92 Prince Street. 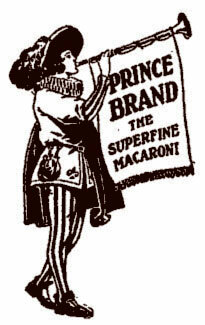 They became so successful that within five years, they moved their Prince Pasta Company to 207 Commercial Street. 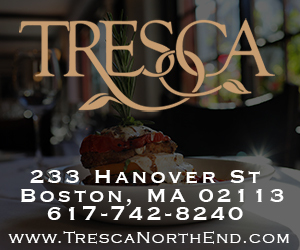 Then, in 1939, the three partners moved the entire operation to Lowell, where they were joined by Guiseppe Pellegrino, another Sicilian immigrant with a deft hand at marketing. Pellegrino eventually bought out two of his three partners – – LaMarca and Seminara – and proceeded to build Prince into a national brand. He created the famous radio slogan “Wednesday is Prince Spaghetti Day” in and in 1969, under the direction of his son, Joseph, Prince introduced its most memorable TV commercial, featuring Anthony Martignetti and the refrain of a mother peering out a tenement window, calling to her son to come home for a supper of Prince spaghetti. Joseph Pellegrino, took over the presidency of Prince Pasta from his father Guiseppe in 1972, eventually selling the company to Borden, Inc. in 1987. These two business success stories aside, most Italian North Enders found life hard, both economically and socially. Anti-Italian sentiment remained deeply ingrained. With the close of the First World War and the rise of Bolshevism, a new “Red Scare” ran rampant across much of the United States. This, coupled with the growth of Italian fascism and the anarchist movement, made for a hostile political climate towards immigrants and radicals. 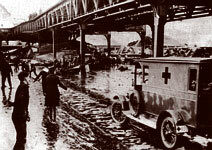 On January 15, 1919, a 50-foot tank filled with 2.3 million gallons of molasses exploded on the North End industrial waterfront, causing widespread destruction and taking the lives of 21 people and injuring another 150. The blast was initially believed to be the result of a terrorist act. This was a main line of argument by attorneys for U.S. Industrial Alcohol, owner of the storage tank; a case of sabotage by political anarchists.The resulting investigation and legal hearings – involving 125 lawsuits – was the longest up until then in the history of the Massachusetts court system. It ended in 1926 with a conclusive judgment: the tank had been improperly designed in the first instance and its failure was due entirely to structural weakness, not to a terrorist attack. Thirteen months to the very day following this Great Molasses Flood, a shoe company paymaster and guard were robbed and murdered in broad daylight in South Braintree. The two perpetrators made off with $15,000. 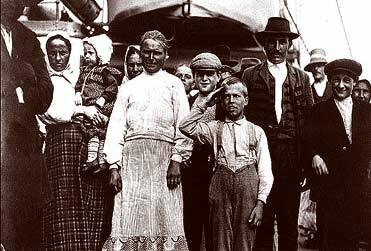 Eyewitnesses claimed they looked Italian.Over the next month, a large number of Italian immigrants were questioned. Two North Enders were arrested – Nicola Sacco and Bartolomeo Vanzetti. Both men were avowed anarchists, who had protested American entry into WW I and had fled to Mexico to avoid conscription into the U.S. Army.At their trial, the main evidence against them was that they were both carrying guns when arrested on a Quincy streetcar. 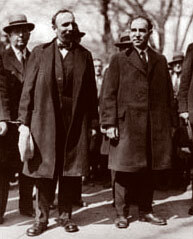 Despite the fact that both men had good alibis – Vanzetti was peddling fish in Plymouth while Sacco was with his wife at the Italian Consulate in Boston having his passport photograph taken – attorneys for the prosecution underscored the fact that those who testified in support of these alibis were also Italian immigrants. They emphasized the men’s radical political beliefs, accusing them of unpatriotic behavior for having fled to Mexico to escape the draft. Sacco and Vanzetti were found guilty of first degree murder and sentenced to death. 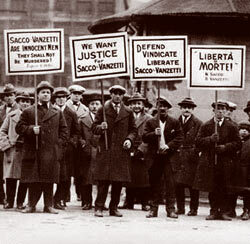 Despite the many appeals filed (and denied), the considerable publicity the case received, and the numerous large public demonstrations in their defense across the United States and throughout Europe, South America and Japan – Sacco and Vanzetti were executed on August 23, 1927. Their wake was held at the Langone Funeral Home, which was then at 383 Hanover Street, and was attended by over 100,000 mourners. The funeral procession, carrying the bodies to the Forest Hills Cemetery for cremation, attracted 50,000 marchers, the largest funeral procession up until then in Boston’s history. Yet even with the waning tide of negative public feelings towards Italian immigrants over subsequent decades, the North End still had to contend with its unsavory criminal reputation. From its earliest days when it was rife with sailors, gamblers and brothels, the neighborhood had a Dickensian quality to it. Even after the Irish influx, gambling and prostitution were commonplace.That some Italian criminal elements – like their Irish and Jewish counterparts before them – preyed upon their own people was nothing new. One example is the short-lived, nefarious career of Charles A. Ponzi, who came to be known as one of America’s “greatest confidence men” of modern times. He founded his Security Exchange Company on Hanover Street in December 1919 with a simple promise: to pay investors 50% of their investment within 45 days.Initial customers were cautious. But true to his word, Ponzi paid these first investors 50% within the prescribed period. 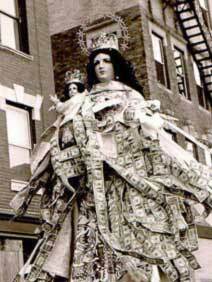 Such a thing had never been done before and as word spread throughout the North End and across the City, money started pouring in. He soon moved his offices to larger quarters next door to City Hall on School Street where money came in so fast that his clerks had to pile it into baskets. By 1920, Ponzi had promissory notes outstanding with a face value of almost $15 million. Charles Ponzi claimed that he was simply sharing with his investors a portion of the 400% profit he was earning through trading in international Postal Reply Coupons. When in 1920 Ponzi’s bubble finally burst , the truth came out: he paid off his earliest investors with money received from his later investors. He had never bought or sold Postal Reply Coupons; they simply served as his cover for what has come to be called a “Ponzi Scheme” – robbing Pietro to pay Paolo. Like the experience of the Boston Irish before them, Italian-Americans began to accrue political power after the close of WW II and, in this way, started to redress over a half-century of prejudice and neglect. In 1948, Foster Furcolo was elected the first Italian-American Congressman and eight years later he became the first Italian-American Governor of Massachusetts. Fred Langone, whose grandfather had been elected to the U.S. House of Representatives in 1922, was himself elected in 1961 to the Boston City Council, a position he held for the next 22 years. Frank X. Belotti served as Lieutenant Governor from 1963 to 1965, when John Volpe was elected the second Italian-American Governor of Massachusetts. Langone helped establish rent control in the North End in the 1960s, preventing buildings from being taken over by “outsiders” and curtailing the exodus of elderly Italians. He successfully lobbied for the creation of a new Christopher Columbus waterfront park and helped preserve over 70 waterfront warehouse buildings. The North End today retains much of its “Old World” feel. Tourism provides an economic underpinning. However, many neighborhood grocery stores, fruit vendors, butcher shops, bakeries, shoe stores, clothiers and cobblers have simply disappeared to be replaced by restaurants. With a population barely one-quarter of its 44,000 peak in 1930, fewer services are required to sustain the community. Ten of its 12 schools have been subdivided and converted to condominium apartments. Church parishes have been auctioned off to the highest bidder. Times have changed in Boston’s North End. Yet today, Italian-Americans still comprise more than 41% of the resident population. 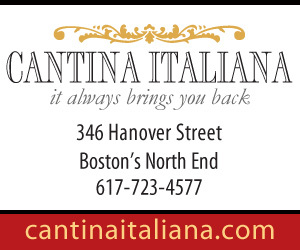 Italian remains the Lingua Franca throughout the North End. It is one of the most vibrant and thriving neighborhoods of its kind.Old customs and traditions die hard (if ever at all). For despite the fact that 50 individual religious societies once existed in the North End and only 12 remain today, these societies with their religious Feasts and Processions remain an integral part of North End neighborhood life and culture, drawing large summertime crowds.After years of construction and the building of tunnels and removal of the elevated Expressway with new open park spaces, the North End has finally, physically rejoined downtown Boston – for the first time in over two centuries.